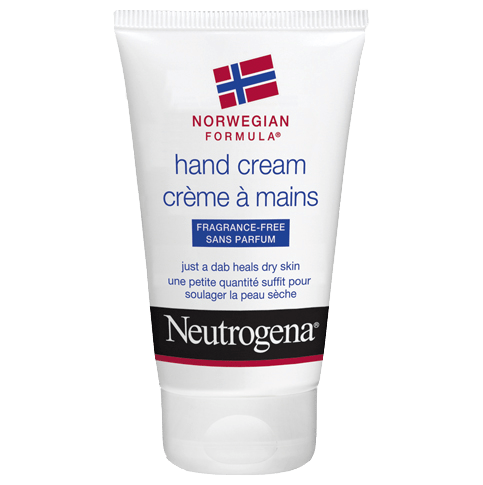 NEUTROGENA® NORWEGIAN FORMULA® Hand Cream delivers effective relief for dry, chapped hands. This clinically proven, highly concentrated skin care formula instantly leaves dry hands noticeably softer and smoother after just one application. Used daily, it helps prevent dry, chapped skin – even under the harshest of conditions. Just a little goes a long way. Water (eau), Glycerin, Cetearyl Alcohol, Stearic Acid, Sodium Cetearyl Sulfate, Methylparaben, Propylparaben, Dilauryl Thiodipropionate, Sodium Sulfate. I use it daily, and apply extra at night. It helps to soften, and heal dry skin. It is not messy, or greasy. Its very gentle, comforting and effective. Keeps your hands feeling moisturized and the non oily feeling is what I love best about this product! Love this cream. I am not a fan of perfumed moisturizers, and this on fits the bill. I frequently wash my hands, and can reapply often. Absorbs well, & nice I don't have to worry about it rubbing off on my little dogs - who are constantly looking for attention...and treats. Great product to relieve dry hands and it is fragrance free so you can use at the office! I put it in my pocket and bring it everywhere. It's really useful in these dry winter days! I tried this Neutrogena fragrance free hand cream and really liked how soft and younger looking my hands looked. The fact that is also fragrance free means it doesn't interfere with my other fragrance.